Juicer Pulp – Wondering What to Do with it? Juicer pulp provides an amazing source of fibre so don’t just throw it away. The best pulp is made when you have removed the core and pips from any fruits or vegetable before juicing them. If you are trying to add an extra source of fibre and fruit into your kids diets then what better way than disguising it in a ice lollipop? If you add the pulp of soft fruits to water or juice, pour it into a mould then freeze it. They’ll love them. 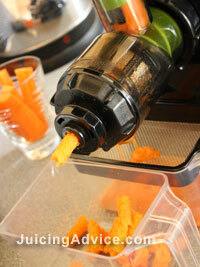 In the photo here you can see the carrot pulp from my juicer. You can add carrot and apple pulp into muffin and cookie mixes to give extra flavour as well as a much needed source of fibre. Visit the link above to see me making muffins in my kitchen – if i can do it, anyone can! Here are some more ideas for recipes with juicer pulp. You could make carrot bread by adding carrot pulp into your bread mix. How about adding vegetable pulp to layered savoury dishes such as lasagne? Or add some to the base of a homemade soup. If you don’t have time to bake or deal with your pulp at the time of juicing then just freeze it straight away and come back to it at a later date. Unlike fresh juice that needs to be drunk immediately after juicing to gain the maximum amount of nutrients, the fibre and goodness in the pulp will retain during freezing. If You Don’t Want to Eat it! Then add it to your garden or even your houseplants. The pulp makes great natural compost. It’s also helping to reduce your landfill so the environment benefits all ways round. I had the most adorable house rabbit that loved nothing more than a bowl full of carrot or apple pulp straight from my juicer. 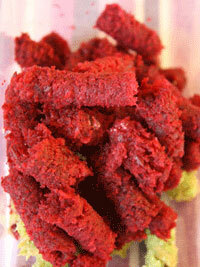 If you have a dog you can mix vegetable pulp into their normal food giving them an extra source of fibre. If you don’t have any pets then how about feeding the birds, they are particularly keen on eating the carrot pulp.